Several former World Wrestling Entertainment (WWE) superstars have arrived in Manila for a 1-night show at the Smart Araneta Coliseum for the WWFX wourld tour 2012. The pro wrestlers, led by former WWE Intercontinental Champion John Hennigan, arrived at the Ninoy Aquino International Airport (NAIAN) Terminal 2 on Friday at 6:30 am. Accompanying Hennigan were MVP, Carlito, Luke Gallows, John Morrison, Jillian Hall, Shief Daivari, Jimmy Ynag, Shelton Benjamin, Chris Masters, Snitsky, Rhino, Melina Shane Helms and Billy Gun. The wrestlers will appear at the “World Wrestling Fan Xperience- Champions Showcase Tour 2012” slated at the Smart-Araneta Coliseum on Saturday. World’s No. 1 player, The Robocop, Dennis Orcollo will begin his title-retention bid when the 2012 World 8-Ball Championship gets underway on February 12 to 17 in Fujairah, United Arab Emirates. “I’m hoping to defend my title… I need to play hard because every player has a chance to be a champion,” said Dennis Orcollo. The former fisherman from Bislig, Surigao del Sur won the 8-Ball title by beating Niels “The Terminator” Feijen of the Netherlands, 10-3, in the finals. With the victory and the $40,000 champion’s purse that comes with it, he cemented his status as one of the world’s best pool players. Dennis Orcollo, who plays under Bugsy Promotions, is backed by Malungai Life Oil, ACCEL, Hermes Sports Bar, Mandarin Sky Sea Food Restaurant, Golden Leaf Restaurant, I-Bar, BRKHRD Corp., and Billiards Managers and Players Association of the Philippines (BMPAP). “We have a stronger lineup and I’m confident that we can win the prestigious crown,” said BMPAP co-founder and Bugsy Promotions top honco Ceferino “Perry” Mariano. Dennis Orcollo’s 8-Ball win last year duplicated the 8-Ball title conquests made by compatriots Efren “Bata” Reyes in 2004 and Ronato “Volcano” Alcano in 2007. The Philippine Volcanoes have received an invitation to compete in the Cathay Pacific/HSBC Hong Kong 7s, one of the most important rugby 7s tournament in the world. The Philippine Volcanoes’ silver-medal finish in the Borneo 7s last September earned them the invite. “This invitation to the Cathay Pacific/HSBC Hong Kong Sevens marks a milestone in the history of the Union” said Alvin San Diego, Philippine Rugby Football Union president. “It’s a testament to the hard work of our players, coaches and supporters and more importantly, proof that Filipinos can excel in the sport of Rugby,” he added. The Hong Kong 7s, considered the premier leg of the HSBC Sevens World Series, is scheduled to take place on March 23-25 at the Hong Kong Stadium. The Hong Kong 7s is a by-invitation-only tournament attended by the top 7s teams in the world like New Zealand, Australia, Fiji and England. The Philippine Volcanoes, led by Men’s 7s captain Jake Letts and guided by national coach Matt Cullen and assistant Noel Flowers, surprised their competitors in the Borneo 7s by beating their highly-regarded rivals one by one. They ended up finishing second to Asia No. 1-ranked Japan. Jeson Patrombon, suffering from a swollen right knee, dropped a 6-3, 6-2 decision against former juniors world number one Marton Fucsovics of Hungary to bow out of the 2012 Israel Men’s F2 Futures. “Jeson has played a total of 13 difficult sets in singles since the qualifying round to get to the quarters this week. (He also played) 15 sets total in this second leg alone here in Israel. Definitely the legs and the knees will have to give at some point,” said coach Manny Tecson. In the quarterfinals match against Fucsovics, the 2010 Wimbledon Boys’ Singles Champion, Patrombon found himself struggling to move side to side to respond to the Hungarian’s attack. “The first set was tight and Jeson could have won that set. Each game was very close. Jeson had double break points with Fuscovic serving at three all for a 4-3 lead, but again, every time Fuscovic was in trouble, he went with his slice backhand moving Jeson from side to side which forced Jeson to lean down on the right leg and bend the right knee which was the key to this match,” described Tecson. 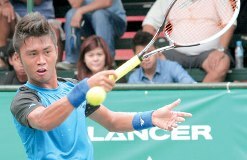 Although Patrombon failed to reach the semifinals, the Iligan native’s final two games earned him three more ATP points to improve his ranking. “I reminded him that he defeated the number three seed from the Netherlands who is a top 300 ATP player. This shows the improvement in all aspects of his game—from the mental, to the technical, to the strategical and the physical,” added Tecson. The Philippine Sportswriters Association declared boxer Nonito Donaire Jr. and billiards superstar Dennis Orcullo as its Athletes of the Year for 2011. Both Donaire and Orcullo will be awarded with their second PSA Athlete of the Year plum for their sterling performance in the past year. In 2007, Donaire annexed his first PSA award with swimmer Miguel Molina while Orcullo will be receiving the Athlete of the Year award for the second consecutive time after he joined Asian Games gold medalist Rey Saludar and Biboy Rivera and world 9-ball champion Francisco “Django” Bustamante for the honor in 2010. Donaire claimed his second world title in three years in February after a second round technical knockout over Mexican Fernando Montiel in their World Boxing Council and World Boxing Organization bantamweight crown in Las Vegas, Nevada. On that same month, Orcullo silently pocketed the world 8-ball crown in Fujairah, United Arab Emirates posting a convincing 10-3 win over Neils Feijen of Netherlands. Donaire and Orcullo went on to accomplish more feats in 2011. The 29-year-old Donaire successfully defended his crown with a unanimous decision over Omar Andres Narvaez of Argentina at the famed Madison Square Garden in New York. The 32-year-old Orcullo flew to Palembang, Indonesia to represent the country in the Southeast Asian Games where he proved that he is a world-caliber by capturing the gold in the 8-ball event. Orcullo also won the Player of the Year trophy by the World Pool and Billiard Association. Donaire and Orcullo will be feted on March 3 in the PSA Annual Awards Night at the Manila Hotel. Also strongly considered for the Athlete of the Year citation was golfer Juvic Pagunsan, who topped the Asian Tour Order of Merit becoming the first Filipino to do so. Manny Pacquiao, meanwhile, has already been elevated to the PSA Hall of Fame making him ineligible for the yearly award. Filipino cue artist Lee Vann Corteza wants to win the WPA World Crown in 2012 and join an elite group of Filipino world champions. “Target kong makopo ang WPA World Crown (8-ball, 9-ball and 10-ball) para makasama ko yung mga Filipino world champion,” Corteza said. Among the Filipinos who have won the WPA World Crown are Efren “Bata” Reyes, Francisco “Django” Bustamante, Alex Pagulayan, Dennis Orcollo, Ronato Alcano and Rubilen “Bingkay” Amit. “Yung na lang talaga ang kulang ni (Corteza), ang World Championship crown,” said Christopher Palses, Corteza’s head coach at the Negros Billiards Stable. A 2-time National Open champion, Corteza hopes to continue his winning run in 2012 when he competes in the Derby City Classic in Kentuky in January, the World 8-Ball Championship in Fujairah, United Arab Emirates in February and the Japan Open in March. Last 2011, Corteza defeated a number of high-caliber opponents, including compatriot and world number 1 Dennis Orcollo. He racked up 4 major titles in the last 5 months. Corteza won the 2011 Golden Brea 9-Ball Asian Invitational Championship in Malaysia last August, the San Miguel Beer Oktoberfest 9-Ball Open Masters in October, the Philippine Bigtime Billiards Face-Off and the Manny Pacquiao International 10-Ball Championships, both in December. Corteza also won the US Open 10-Ball Championship in 2010, which he considers as the greatest achievement of his career. — By Marlon Bernardino. With only one athlete in boxer Mark Anthony Barriga qualified for the Olympics 2012 so far and others still scrambling for slots, sports officials are bracing for what probably could be the smallest Phl delegation in recent years. “The way it looks, our assessment is maybe five to six athletes will be included in the delegation, so that’s a far cry from the last two Olympics,” Philippine Olympic Committee first vice president and chef de mission Manny Lopez said yesterday. Phl sent 15 bets to Beijing in 2008 and 16 in Athens four years earlier. And even if the POC’s conservative target of six would be met, it would be the lowest since 12 carried the flag in 1996. But in that meet, boxer Onyok Velasco brought home a silver medal, the best the country can produce in the Olympiad and Phl’s last medal to date. Barriga placed ninth in the AIBA World Championships to qualify. His teammates led by Asiad champ Rey Saludar and the women’s delegation will try to follow suit in the separate qualifying meets next year as do weightlifter Hidilyn Diaz and a group of shooters. Swimming and athletics are assured of mandatory slots, one male and one female each. Most of the Olympic hopefuls are looking to make it via the backdoor, that is through the “Tripartite Invitation Places “or TIPs in 16 sports and reallocation of “unused slots” or vacancies in six sports. Lopez, however, revealed that Phl has been disqualified for TIPs since only countries with six or less Olympians in the past two editions are entitled to such. Phl is left to seek unused slots in boxing, cycling, fencing, taekwondo and wrestling. “Our only chance is if some slots will be given up in six sports where we can get it as substitutes. So we’re encouraging NSAs to convince their respective international federations to grant them slots,” said Lopez, reportedly groomed as a candidate for the next POC polls. He lamented the dwindling number of Pinoy bets in the Olympics. “While others have been improving by leaps and bounds, sad to say, we’ve not been developing competitively on a high standard. For the first time, wag naman sana, this would be our lowest number of contingent for the Olympics. But we’re still thinking on the positive side kaya pinipilit naming gawin ang lahat para madagdagan,” he said. Filipino billiards icon Efren Bata Reyes and Wu Jia Qing rekindle their rivalry when they square off in the Philippine Bigtime Billiards (PBB) Face-Off series Friday at the Airport Pagcor Casino in Parañaque City. Sports betting at Mega Sports World favored Wu against Reyes as of Thursday. A $1 bet on Wu will win $1.68, while a $1 bet on Reyes will win $191. The match-up is one of the weekly face-off series pitting local and foreign cue artists in a race-to-9, 10-ball event. The winner will take home $5,000, while the loser gets $2,500. “I trained hard for this fight so I can give a good show for pool fans,” Reyes said. Wu edged Reyes, 9-8, during the quarterfinal round of the 11th Predator International 10-Ball Championship last September. Among the Filipino stars who have played in the PBB Face Off series are Carlo “The Black Tiger” Biado, Orcollo, Ronato “Volcano” Alcano, Francisco “Django” Bustamante, Lee Vann “The Slayer” Corteza, and Roberto “Superman” Gomez. — by Marlon Bernardino. Former Rizal Technological University (RTU) top player Roberto Suelo Jr. made short work of local bet Winshand Cuhendi Sean in the 5th round of the 8th Singapore International Open Chess Festival at the Jurong East Sports Complex in Singapore. Suelo’s victory allowed him to join a crowded leader board in the tournament. Suelo, a professional chess coach in Singapore for the past two years, forced Sea to resign after just 18 moves of Queen’s Pawn Opening to notch his second straight win and fourth in five games. The latest string of victories for Suelo came at the heels of his third round defeat against Grand Master Eldar Gasanov of Ukraine. Gasanov settled for back-to-back draws against FIDE Master Andrean Susilodinata of Indonesia and Benjamin Foo of Singapore to relinquish the outright lead. “Even after losing to Gasanov, kumpiyansa pa rin ako na makakahabol ako to contend for the title,” Suelo said. Suelo is eyeing his third title in Singapore this year, following his triumphs in the Hari Raya FIDE-rated chess tournament and Toa Payoh Open. His victory also eases the pain of the sorry loss suffered by Filipino GM Richard Bitoon in the 2nd ASEAN Men Campomanes Cup. Bitoon had a chance to grab the outright lead in the centerpiece event of the annual chess festival, but ran into time trouble against International Master Nguyen Van Huy. Bitoon ended up losing the game and his share of the lead as GM Susanto Megaranto of Indonesia split a point against IM Hafilzulhelmi Mas of Malaysia. Megaranto’s 4/5 effort topped Bitoon’s 3.5/5 midway in the round-robin tournament. They are set to meet in the 9th and final round. Meanwhile, young Filipino chessers continue to hold sway in the 2nd Singapore International Youth Championships. Vince Angelo Medina remained on top of the Open Under-17 with 4.5 points after a draw against Jung Young Hoon of South Korea, while Michelle Yaon extended her winning run to four after taking a bye in the 4th round to seize control of the Girls U-17. Yaon also got an assist from compatriot Nikki Erica Yngayo, who dealt the first loss of pre-tournament favorite FM Danielle Ho of Singapore. Paulo Bersamina moved a full point ahead of the field in the Open U-14 after notching his fifth straight win, this time at the expense of Tupfah Khumnokeaw of Thailand. FM Marie Antoinette San Diego was slowed down by consecutive draws, but remained on top along with two others in the Girls U-14. Dennis Gutierrez III kept a perfect record and his share of the lead in the Open U-8. The Open U-11, Girls U-11 and Girls U-8 were the only divisions without a Filipino on top. —By Marlon Bernardino. Lee Van Corteza defeated the reigning world No. 1 player Dennis Orcullo and bags the Pacman 10-Ball Cup. Corteza, who won the US Open 10-Ball last year, defeated Orcullo, 11-8, in the finals of the Pacman International 10-Ball Cup to bag the $30,000 top prize put up by eight-division world boxing champion and new pool godfather Manny Pacquiao. A runner-up of the World Ten Ball Championship in 2009, Corteza entered a tough semifinals showdown with the power breaking Jeff de Luna before prevailing, 11-9, and arranging a titular showdown with the newly-minted WPA Player of the Year. Orcullo, the current holder of the World 8-Ball title, outlasted Jeremy Diaz in a similar neck-to-neck race for a finals berth. In finishing second, Orcullo settled for just $10,000 and fell short of adding yet another international title to his list of collection this year.